If you are looking for Co-Founders, want to join an early-stage startup, or just want to connect with some brilliant inventors / entrepreneurs, this is the meet up for you. Since 2010, we are organizing pitch events for co-founders to network and those who want to work for a pre VC stage startup, or are looking to invest in one. Cofounders Austin is like networking event, except fun; like a party, except business-oriented, and like a startup pitch series, except informal and fast-paced. The result is a one-of-a-kind experience that makes for the perfect evening with food and beverages provided, for entrepreneurs, investors, tech enthusiasts, and fun seekers alike. Every second Tuesday of every month, we gather at Capital Factory (downtown Austin) from 6:30-9PM. This month we’re meeting on August 10, 2015. Upon arrival you’ll receive a color coding which will help you to identify yourself and help others to know who they want to talk to. With five multi-million-dollar business success stories to his name, and a prestigious Young Achiever Award, Matthew has been characterized as a true differentiation, niche marketing, and sales systemization powerhouse. Matthew is a recurring guest on Fox7’s Good Day Austin, as well as a featured contributor to CEO, Entrepreneur, and Top Sales World Magazine. He is also a sought after judge at many of Americas most prominent startup events including Google Start-up Weekend, AngelHack, and Microsoft’s 60 Seconds to Startup. Matthew now brings about rapid growth and business transformation around the world, through his many speaking and coaching activities as well as his top-rated iTunes podcast Better Business Coach. 9:00 – Until whenever. Go downstairs to the bar to network more. Want to win our yearly VIP membership to CoFounder Austin Meetup and attend our events for FREE? Email us (team@thetechmap.com) your funny picture wearing our TechMap gear and we’ll announce the winner at our September event. Want to win cool prizes including various event tickets and/or our cool TechMap gear? Just bring your business card and enter our raffle. 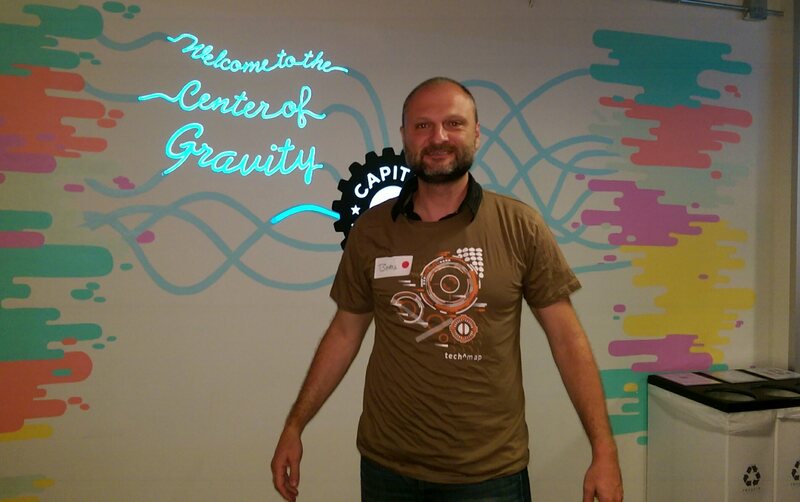 (Thank your to our last month’s winner Boris for posing with our newly designed TechMap Tee). become a SPONSOR and HELP US grow our Austin entrepreneurship! become a presenter, volunteer or ambassador (in Austin, Chicago, New York, Los Angeles). Previous Walk into a startup event. Pitch. Find an investor.